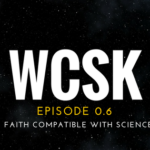 What Christians Should Know: Is evolution compatible with the Bible? 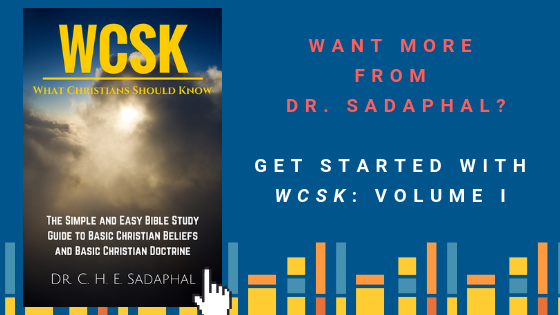 What Christians Should Know (WCSK): Volume Zero provides crucial answers to critical questions about belief. All Bible verses used are from the NASB unless otherwise noted. 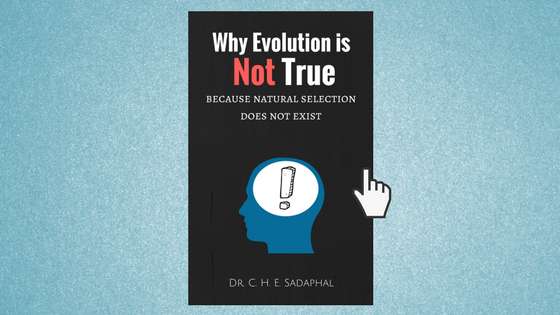 Before I move on, I would like to invite all of my readers to download my new, free eBook called Why Evolution is Not True: Because Natural Selection Does Not Exist. There, I synthesize information from many different fields of science to expose how anemic and intellectually bankrupt the theory of evolution really is. Let’s begin by defining terms and explaining what evolution actually is. The theory of evolution was born in the 19th century in Charles Darwin’s book, The Origin of Species. Evolution was thought of as a blind, automatic, and gradual process that requires no intervention from an outside agent. Evolution doesn’t need God, because the impersonal forces of nature exclusively drive extraordinary change. Evolution states that the undirected, purposeless power of nature is perfectly able to create the diversity of species. In simple terms, evolution refers to the idea that a species’ genes change over time. Our DNA is the code that programs life. Our DNA contains genes and our genes code for different traits like hair color, brain size, and the bones that constitute our skeletons. So, as time goes on and species change genetically over generations, one species (e.g., an orangutan, which is a type of ape) can “evolve” into another species (e.g., humans) because of genetic change. As the theory goes, the source of genetic change comes from mutations that are random changes in DNA. Evolution does not happen evenly, but it does happen gradually over thousands or even millions of generations. When a common ancestor accumulates enough genetic changes, the ancestral population speciates and “splits” into a new and distinct species. When most people think about evolution, they are really thinking about speciation, whereby one species evolves into another so that, for example, an orangutan can speciate into an intermediate species, then the intermediate species can speciate into a human being. Evolution is supposed to work by natural selection, the engine that drives evolution. Simply put, natural selection refers to the idea that individual organisms vary genetically, and this genetic variance affects each organism’s ability to survive and reproduce in its environment. For example, a gene that codes for longer legs in wolves enables these wolves to run faster and thus catch deer more quickly than wolves without the gene. Because these wolves have an adaptation that enables them to survive better than others, nature “selects” for the gene that codes for longer legs. These beneficial genes are passed on to members of the next generation, in which more copies of the beneficial genes would exist relative to not-so-beneficial genes. These beneficial genes would in turn equip some individuals to survive and reproduce more and thus repeat the process. Accumulated adaptations over time leads to speciation. Natural selection is metaphorically called a “blind watchmaker” that “selects” the best genes. The blind watchmaker therefore has no purpose, no vision, no mind, and no plans for the future. Natural selection is not an event but a process—by definition, it is an ongoing progress where very small genetic changes happen in a population, and the accumulation of many small changes over long periods of time yields enough genetic change to evolve a new species. As a whole, the theory of evolution attempts to explain the diversity that we see in nature. It does not attempt to offer an explanation for the origin of life, only the diversity of life. How the universe came into existence, how the Earth came to be, and how the first cell came into existence all fall outside of the theory of evolution. What falls in the boundaries of evolutionary theory is how a single cell billions of years ago evolved into orangutans and humans. To repeat, evolution is a blind, automatic, and gradual process that does not require any intervention from an outside agent. The big idea of the Bible’s creation narrative is that ‘God did it’ and that creation is a spontaneous, purposeful event that required the exclusive intervention of an all-powerful God. So, before we even get into the details, it is clear that evolution and the Bible say totally divergent things. The Bible begins with four famous words: “In the beginning, God.” The Bible does not say, “In the beginning God and” or “In the beginning, something other than God.” The Bible says, “In the beginning, God.” Consequently, in the creation narrative of Genesis chapters 1 and 2, we find an overarching theme: that God is both sovereign and the exclusive creative cause that makes all of reality. God neither seeks any help nor does he “set it and forget it” and leave the task of creation to another designated agent, because He personally and actively creates all of creation. In fact, when we look at how God creates, we observe a very simple pattern in the Bible’s first two chapters: there is (i) an agent, (ii) order, (iii) finality, (iv) totality, and (v) specificity. I clarify these five points below. The above verses all represent how creation was executed. They demonstrate that in the mode of creation there is one agent—God—who speaks creation into existence. He and He alone spoke by His divine imperative; what He willed into existence came to be. There is a direct and exact correlation between what God said and what was created; in other words, all that was made come from the Lord’s specific, targeted commands. God did not play dice, nor did He permit anything else to create because nothing else had such creative power. If we stick to the text of Genesis 1 and 2, the Bible does not describe any other creative agents besides God. Evolution says natural selection has the power to mold new, diverse species. The Bible says only God has the power to create life. He designed all of it. The sequential days of creation reveal that there was a specific order of reality being made. On the first day (1:3-5), for example, God said, “Let there be light,” and light came to be. Each of the resultant days of creation involved a specific set of things made on that day. God had a fine-tuned plan for creation that manifested in a precise, predetermined order. Reality was never left to itself, nor was the order of creation a blind process. Figuratively speaking, God had His eyes wide open during the creative process. Therefore, things could not have been created out of order, because this would have fallen outside of God’s structured plan. “Thus the heavens and the earth were completed, and all their hosts. By the seventh day God completed His work which He had done, and He rested on the seventh day from all His work which He had done.” (emphasis added). God rested on the seventh day because everything that had to be created was created, so the Lord rested from all His work. After creation was done, it was forever and totally done. Genesis tells us that life was imbued with the inborn ability to reproduce and multiply. This ability was not acquired, it was given. This explains how God could bless plants, animals, and humans and then give the command to “be fruitful and multiply.” God could give this command because He created categories of life that were fully-formed with the inborn ability to reproduce after their kind. This inborn ability enabled them to solve environmental problems and fill the earth. So, fruits did not begin as something simple, they began as fruits. Birds did not begin as something much simpler that lacked wings, they began as birds. Men and women began as two distinct sexes that are biologically compatible and able to produce offspring. This is not something that gradually developed over time; both sexes were designed that way. Additionally, there was specificity in creation, meaning each category of creature was designed to produce the same category of creature. Orangutans were not designed to eventually beget humans. Orangutans were designed to beget orangutans. The Bible says every kind had the inborn ability to reproduce and make more of its kind. Kind comes from a Hebrew word (מִין) that is always used in the context of a taxonomical system and refers to a class or species that differs from other classes or species. So, in the creation narrative itself we have God making different species and each species has the inborn ability to reproduce and engender more of the same species. The creation of humankind is special event in creation. God spoke the rest of creation into existence, but God formed humankind from the dust of the ground and breathed into their nostrils the breath of life (c.f. Genesis 2:7). God did not either form or breathe the breath of life into any other entity in creation. This distinguishes humanity as unique from the rest. “Let Us make man” is an indication of purpose and intent. So, not only are human beings unique compared to the rest of creation, they are also image bearers of God. A plant or a puppy are not image bearers. This explains why only humans have superior intelligence, morality, reason, and logic. From the standpoint of evolution, humans are not special because the same blind process that “created” birds and apes also made us. So, we are mere animals. The Bible disproves this in unambiguous language. What this all means. What the Bible says about life refutes evolution in clear and unmistakable terms. Evolution says the diversity of life is the result of a blind, impersonal force that lacks foresight. The Bible says life is the result of an omniscient, purposeful, and personal God. Evolution doesn’t need God for life to diversify. The Bible demonstrates God’s sovereignty over creation and creation’s dependence on the Lord. Evolution says natural selection “selected” adaptations gradually over time. The Bible says God made life fully formed and functional with certain innate abilities that did not require further development. Evolution says there is an external selection force that molds life. The Bible says God made creation and He has masterfully programmed His creatures with internal adaptive power. In many ways, evolution is the exact opposite of what the Bible says and evolution tries to take credit for what God already did. Whenever a skeptic attacks the Bible, the most likely target is in the first eleven chapters of Genesis. It is no surprise, then, that evolution essentially challenges and provides alternative facts to the creation account. This is not a coincidence, as the philosophy of evolution strives to convince people that if life can be explained without God, then what’s the point of bothering with Him? What about theistic evolution? Theistic evolution is the idea that God either started or supervised evolutionary processes in some way. Essentially, theistic evolution is not true because it is still predicated on the erroneous idea of evolution. Many people regard theistic evolution as a compromise between what the Bible says and what science says. In reality, theistic evolution downgrades God to less-than-God because He is neither sovereign nor competent enough to make all of life—He had to rely on something else to do it for Him. Indeed, because the Bible makes it clear that God is sovereign and provident, when it comes to legitimate natural forces (like gravity), God’s agency both creates such a force and sustains it. Nothing therefore operates outside of God’s agency. Theistic evolution rejects God’s agency in one form or another. What many Christians fail to realize about evolution is that if you believe in it, then death is simply an ordinary process that is the result of biological decay. In other words, no one ever needs to bother with sin because death is natural, not spiritual. The Bible says death exists because of sin. 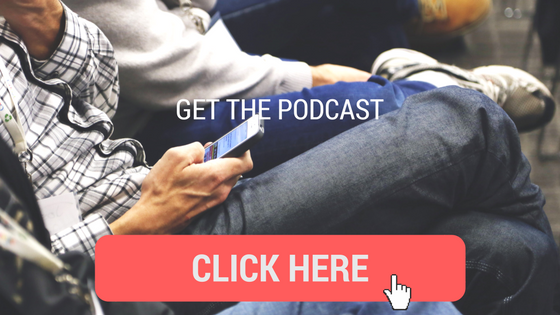 So, with an evolutionary worldview, sin does not exist, and therefore there is no need for Someone to deliver you from the ramifications of sin. Thus, in a sneaky and subtle way, evolution tries to subvert Christ the Messiah. Let’s try a little experiment: look at a glass of water. It many not seem like it, but there are millions upon millions of single-celled bacteria floating around in that glass. Take the glass of water and put it next to another person. Now imagine all those tiny bacteria in the glass as you look at the person. Evolution says that if you give that glass enough time, a blind, undirected force can mould the single-celled organisms in the water into the person. Does that strike you as reasonable or unreasonable? Logical or senseless? Plausible or ridiculous? 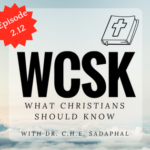 What Christians should know is this: in contemporary society, many scientists interpret the “facts” of evolution for us, and tell us that beyond the shadow of a doubt evolution is true. The reality is, when you actually examine the “facts” for yourself, what you will find is that when you consider the full breadth of scientific knowledge about life, the presupposed facts supporting evolution are rare, isolated, and very unimpressive. In fact, the more we learn about life, the more science mounts evidence and builds a case against evolution. In the scientific community, this is a fact that is well established in private but seldom mentioned in public. Speaking as a medical doctor, I can tell you conclusively that all science can do is reveal how astronomically complex life is, particularly at the cellular level. This mind-boggling complexity demands the reasonable conclusion that life had to be designed. In fact, whenever we open our eyes and see something that has the appearance of design—even something simple, like a soda can—reality tells that that an intelligent designer is the cause. Science cannot precisely explain how life evolved step-by-step from a single cell to plants, animals, and human beings. This is exactly the point—science cannot explain, using natural phenomena, life that has a supernatural cause. All science can do is describe life as we observe it now. Ultimately, the secular world in which we live needs to uphold a Godless worldview, which is why the theory of evolution must be protected at all costs—even if that means denying what the facts really say and fabricating a worldview in direct opposition to what real science actually suggests. The following reasons why evolution is not compatible with science are highly abbreviated excerpts from the eBook Why Evolution is Not True. If anyone is interested in a more in-depth analysis, you can download your free copy of the eBook at truthfinder.org. If you take the time and read the work that birthed the theory of evolution—Charles Darwin’s Origin of Species—what you will find is the gross absence of facts and supporting evidence. What Darwin put forth in the Origin was merely a hypothesis. He merely speculated about what could be (philosophy) without actually demonstrating how (science). These philosophical conjectures actually prove nothing. Essentially, Darwin spent hundreds of pages supposing what could be and provided many theoretical examples of how evolution may work, but his theory never went beyond what he supposed in his head. And, when we connect what Darwin wrote in the 19th century with what modern science tells, we discover that evolution does not¾in clear and definitive terms¾describe how it interacts with the molecular machinery that makes life possible. Therefore, evolution’s worst nightmare is being forced to actually explain step-by-step in precise detail the exact stages of how the molecular machinery that operates in a single cell evolves into a regulated, conscious, and functional organisms with billions of cells, dozens of interacting systems, and a degree of complexity so awe-inspiring that it makes an iPhone look like the crude tinkering of a toddler. Ultimately, evolution by natural selection does not provide an exact explanation for how complex life is and how complex systems are produced¾it only speculates. In order to go from one simple cell in the middle of a pond billions of years ago to a modern human, you need an explosive increase in the amount of genetic information. Evolution says the source of that new genetic information comes from mutations, but genetics tells us that mutations tend to pollute existing genetic information. Mutations tend to be enemies to life, not friends. Cells recognize mutations as an error¾this is why mutations that have significant effects are almost always dangerous. When you think of mutations, think of cancer. In many cases, cancer is caused by a mutation that prevents a cell from dividing, so tumors can grow unchecked and spread. This explains why, in more than half of all cases of cancer, people have a mutation of the p53 gene. The point is that our DNA is like a computer code: it contains instructions for running the apps that control our lives and regulate functions. Mutations do not tend to improve this functionality—they tend to destroy it, and mutations never increase genetic information. So, mutations are bad. But where does evolution gets its new genetic information from? Mutations. That makes evolution a very bad idea, because what evolution essentially is saying is that a blind, undirected force uses cancerous mutations to build life. Evolution is presupposed to work on genes, in the structure of DNA. DNA is a medium that codes for a message. The issue is that the medium and the message are two separate and distinct things. 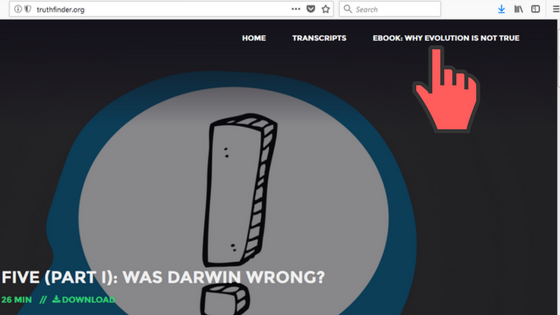 So, by way of analogy, evolution attempts to explain the organization of elements that compose a microchip, but not the coding that allows you to do a Google search. A computer that lacks a message is just a shiny box that does nothing when you plug it in because it won’t even turn on. Similarly, in a book, the medium (the molecules of ink on molecules of paper that form symbols) has nothing to do with the alphabet, language, and message that an author wants to convey. So, because the message is not reducible to matter, a theory that explains life must also explain the message¾something that blind, undirected evolution does not do. If evolution were true, in the fossil record as a whole, we would expect to see slow, gradual transitions from one species to another. In other words, the record would tell a story of very, very small, very, very gradual transitions over long periods of time. The story that the fossil record actually tells us is the sudden appearance of different classes of animals that are fully formed. The record speaks loud and clear and testifies to the fact that fossils show up with a bang and then are static. As a whole, the fossil record is a hostile witness against evolution because of the utter lack of compelling evidence. In fact, what the fossil record does provide is compelling evidence against gradualism and evolution by natural selection. Because of this overwhelming fossil evidence, it is clear that evolution did not act in epochs past, because the record tells us exactly what we would expect if evolution were not true. So, evolution is neither compatible with the Bible nor is it compatible with science. Evolution is compatible with science fiction. It is a wonderful work of the imagination that merely amounts to a nineteenth-century creation myth that tells the tale of a magical, invisible, and blind force that transformed goo into the things you see at the zoo. It is an idea that only has credibility in the imagination, but nowhere else. It is an extraordinary claim that lacks extraordinary evidence. Evolution is not compatible with biblical truth because it essentially contradicts everything the Bible says. 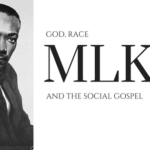 There is no compromise between this 19th century manmade theory and divine revelation. Once you know the truth and uphold the Bible as God’s infallible, inerrant Word, you must reject evolution. To accept evolution and what the Bible says as both true is a contradiction. Quite frankly, what you have left is not the God of the Bible. What you have left is an inept Creator who had to find something else to diversify life for Him. Accordingly, attacks from evolutionary theory leveled at the Bible—at its core—have nothing to do with science. That is the packaging that the attacker wants you to believe. In reality, the purpose of all of the attacks that evolution wages on the Bible is to deceive you into thinking that Genesis 1 and 2 are not true. If you believe that lie, you are not far away from rejecting other things that God said and then, ultimately, rejecting God Himself. The beauty of being human is that we all have God-gifted minds and our benevolent Lord intended for us to use them. So, when we actually sharpen our wits and examine all the evidence that science provides for us, we find that God was right all along. He provided the global, general details about creation in Genesis and modern science merely expounds on the finer details. There is no plausible way that God did not create all life, because life as we know it is so complex; if God’s did not do it, then life would never be. That is the majesty and wonder of the God of the Bible, whose thoughts are higher than our thoughts and whose ways are higher than our ways. Hi Rev thank you for giving clear overview about creation and evolution.And now have known.Have been also reading some of your article that teaches alot about life.Well done!